Desktop Info displays system information on your desktop in a similar way to some other desktop information tools. Unlike others, this application looks like wallpaper but stays resident in memory and continues to update the display in real time. Uses very little memory and nearly zero CPU. Perfect for quick identification and walk-by monitoring of production or test server farms. Everything is customisable including language. How to extract: Download the ZIP package and extract to a folder of your choice. Launch DesktopInfo.exe. and most often starts a blinking epilepsy. Anyone else experiencing this puzzling behaviour ? 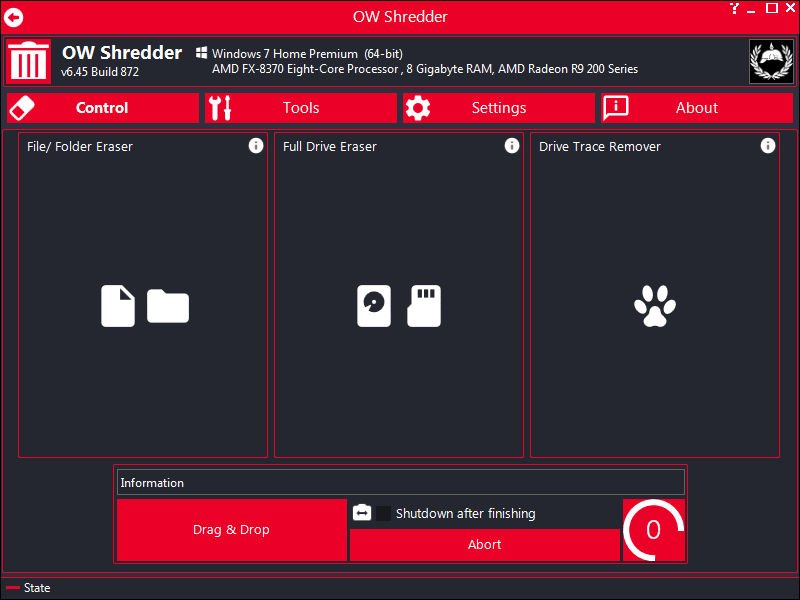 OW Shredder erases files irretrievable by overwriting the affected file data blocks on the disk space, which prevents the reconstruction of the deleted documents. The program can wipe individual files, free disk storage, as well as entire disks or volumes. The program includes basic disk usage analyzer, file unlocker, autostart manager and more. Various erasing methods are available, with more iterations (wipes) taking longer to execute and potentially more secure. How to extract: Download the ZIP package and extract to a folder of your choice. Launch OW Shredder.exe. Software web parts updated to schiffer.tech. I really like the look of this software, now for testing. Thanks for your hard work and allowing us to use it for free. Can't find what you are looking for? This list shows entries with System - Machine Info as a supplementary function. You can view more entries with System - Machine Info as a primary function.